The plumber is the one of the best puzzle games in the market. All you need to do is to rotate pipes, connect them and make water paths. Touch the pies to turn them. Construct a water path from valve to container. Solve puzzles fast to collect more water. Compete with others in your plumber skill vie Global Leaderoard. 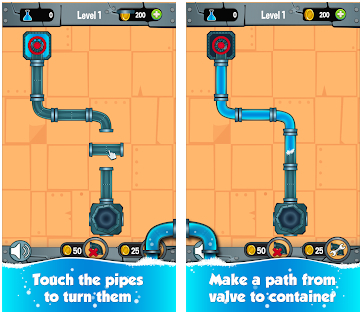 Try to collect more water to beat all other plumbers worldwide! You can always use hints if you have got stuck in some level. This game is without a doubt one of the best Plumber games in the market. Download this game for Free and became the best plumber player in the world!